Strepen Drie is a striped serving board that will make your hors d’oeuvres, sushis, or cheeses look even more delightful. 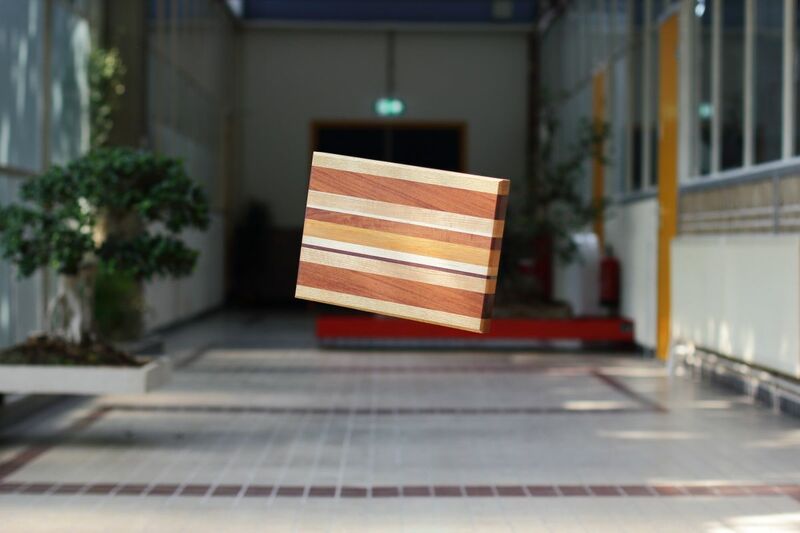 This is Espenaer’s third striped serving board – Strepen and drie simply mean ‘stripes’ and ‘three’ respectively in Dutch – and has the honor of being the most diverse piece of work in terms of materials we have ever made so far! Strepen Drie is a unique and original individual piece, the only one of its kind. It was crafted on a one-off basis by hand using artisanal skills, techniques, and hand tools. No machinery was used in the crafting process. The serving board is composed of an astounding 8 (!) precious fine woods with an interesting history. The walnut, mahogany, ramin, and purpleheart were acquired from an old retired Amsterdam woodworker who specialized in quality wooden barometers, a craft that is now almost extinct. He used these fine woods for his masterpieces, but has recently ended his work due to old age and illness. We were happy to acquire his wood and give it a second life. The honey locust is salvaged from a tree that once stood in our very own city, Amsterdam, in the Apollolaan to be more precise. The wood was acquired from Stadshout Amsterdam, a foundation dedicated to giving wood from logged Amsterdam trees a second life. Finally, the oak, beech, and maple are materials that we have used in our courses, so they have a history in Atelier Espenaer. The price includes VAT. Shipping within the Netherlands is free of charge. For international shipping additional fees apply. Inquiries about this piece may be addressed to info@espenaer.com. If you wish to have this model in different dimensions and/or adjusted to a particular setting, you may benefit from our customization service. Espenaer’s Customization Service allows you to order a custom-made piece based on this model that fits your particular needs and preferences. You may define your own dimensions, select the wood types you prefer, and request minor alterations to the piece, such as door handles. The furniture piece will be built from scratch specially for you. More information about our made-to-order services is available here. If you are interested in customizing this model, please fill in the form below and request an offer. We will be pleased to get in touch with you to discuss how we can serve your needs best. Requesting an offer is free of charge and does not commit you to a purchase. The same as in this model. Different than in this model. If you prefer different materials, please describe these below. In case of more than one type of wood, also specify for which part(s) of the furniture piece each of them should be used. Do you require any alterations to minor details, such as door handles, hinges, or drawer knobs? If so, please describe these in detail below. Note: if you require more fundamental changes, please consider our Bespoke Service. Do you have any remarks or questions? If so, please write these down below. The price for your custom-made piece will be determined on the basis of the given dimensions and requested alterations and will be given in the offer. Requesting an offer is free of charge and does not commit you to a purchase.